The following is an excerpt of Kari Nevalainen's Finnish original which was published on HiFi-lehti's website here. Kari has translated the original for the benefit of our readership in an impromptu form of "syndication" and we extend our sincere gratitude to our Finnish friends for allowing us to reprint it here. If you're like me, you've been in this hobby for at least two decades. You've let dozens and dozens of commercially available gadgets pass through your hands. You've auditioned and experimented with different constellations of equipment only to reshuffle things and audition them again. You've followed regular HiFi magazines (in five languages no less), copied articles, bought books and even reviewed gear for magazines perhaps. Then, like me, you may think that you possibly know something about amplification, the speaker interface, resonances, distortion, time alignment, tubes or just sound reproduction in general. And then, like me, you'd be mistaken. You haven't seen nuttin' yet. Don't believe me? 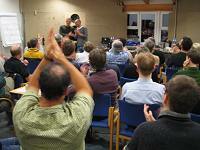 Sign up for the next European Triode Festival (ETF). I guarantee that it'll make you feel humble - like "a small potato" as one participant put it. The downside? Due to a limited number of tickets and certain procedural reasons, most spots for ETF05 may already be gone by the time the festival is open for booking again - the regulars make up 80 to 90% of attendees. Here's how it all began five years ago, as recounted by Christian Rintelen. In March 2000, two Americans, J. C. Morrison and Blackie Pagano, organized an event called "N.Y. Noise". It took place in Morrison's loft in Hoboken/New Jersey. N.Y. Noise was a very informal -- or rather chaotic -- event but apparently, loads of fun. 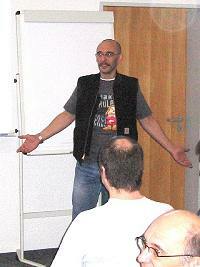 Joe Roberts, publisher of Sound Practices, was an ex officio key speaker. And a few Europeans flew over to participate, among them Thomas Mayer, Allen Wright and Christian. 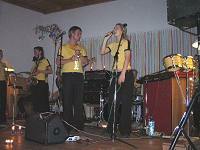 When N.Y.Noise found itself discussed in an email forum, Kurt Steffensen from Denmark decided that the Europeans needed a similar event so he organized one in August 2000. The event was named Århus Triode Festival after Kurt's Danish hometown of Århus. Around 40 people participated and enjoyed it so much that despite the considerable efforts required to put it together, Kurt repeated the event in 2001 and 2002. From Århus, the Triode Festival next moved to Langenargen, a small German town by Lake Constance, between Landau and Friedrichshafen. Christian and Wolfgang Braun took the organizer's reigns into their hands and the festival changed its name to become the European Triode Festival, the idea being that the festival would travel around Europe, having different people organize it and drawing a somewhat different crowd each time. 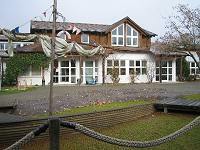 While maintaining a family event atmosphere, ETF of Langenargen grew a bit more professional. For the first time, the festival now had a proper schedule, even if drawn only on a blackboard. Christian also established the practice of inviting guests of honor to present key-note addresses. In 2003, this was Steve Bench, in 2004 Lynn Olson. ETF03 was a big success, ETF04 -- according to many -- better yet. This reminds me of what my carpenter recently confided: "When you make a speaker pair, always make three, the first just to know how the next two should be made". This year, ETF05 will once again be held in Langenargen, thereafter most likely in the Netherlands. Superficially, it is relatively easy to appreciate what ETF04 was all about. Eighty-or-so people from four continents, some with their significant others, gathered together for a long weekend in a holiday resort to attend well-prepared lectures and workshops, see the hottest tweaks, hear the latest news and gossips from the tube front, evaluate equipment, listen to music, meet friends, eat, drink and have fun. But that's the mere surface. Many more interesting things happened within the undercurrents. We all know enthusiasts who express their approach to audio by saying "hey, I don't care what's inside of an amp as long as it sounds good". As much as I sympathize with this attitude -- much vintage gear, when you look inside, is far from perfect but still manages to sound as if it were -- the people of ETF are not representatives of this group. 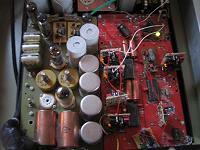 On the contrary, they do care very much about what goes on inside an amp or speaker or turntable for that matter. Most amps at ETF displayed their chests wide open, allowing you a direct view at their innards. No capacitor or resistor went unnoticed when the people of ETF tried to trace down those components responsible for the sound. In doing this, I got the impression that nobody was mentally blind-sided and constrained by some standard canonical view of how an amp should be built (either mainstream or AES). On the contrary, I found them to be broad-minded and -- equally important -- free from commercial pressure. Impracticality was almost a virtue here. It follows that at ETF, low-powered tube amps, mostly built around directly heated triodes, aren't privileged just because they are cool, chic, trendy or what have you. SETs and class-A PP designs are considered superior because, generally speaking, they sound better. That's all. And as many either on stage or in the corridors testified, there are plenty of hard scientific data and experiential knowledge to support such claims. 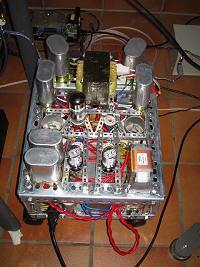 No doubt things can go wrong in small triode amps but in many respects, they are not predestined -- though perhaps not always -- to go wrong as Class A/B designs do, be they transistor or tube. Thanks to their commitment to localize the origins of an amp's sonic fingerprint, the participants of EFT are also prepared to tell you why. Is ETF then a kind of DIY event? Yes, but not for beginners, not for kit builders. ETF is a DIY event for those for whom doing things with their own hands is a way to apprentice the process of learning, to develop a superior understanding of how something works. What people in ETF do share with beginners, however, is their amateur spirit: loving what they're into for its own completely non-commercial sake. What differentiates them from the beginners is simply a higher level of knowledge and experience. If you need to put them in a box, call them professional amateurs. ETF 2004 altogether had six lectures. On day one, Lynn Olson and John Atwood presented a discourse on current loops in PP and SE amps and on how to best avoid coloration caused by capacitors in the signal path. Next Peter Millet reminded the audience about the irrelevance of THD measurements, i.e. 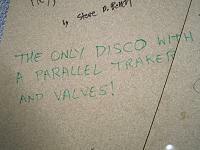 the importance of the distribution of harmonic distortion components. Millet concretized his point with his Magic Box, an amplifier that allows switching from 5% THD consisting mainly of second-order harmonic distortion to the same amount of third-order harmonic distortion and so on. 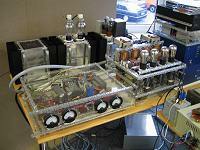 Steve Bench, with his exuberant style, demonstrated his new RIAA amp with low-C tubes and no signal-path capacitor. The amp gave very little to complain about soundwise. On day two, Morgan Jones, author of Valve Amplifiers , talked about screening and shielding in order to avoid hum and other noise problems. Jean-Michel Le Cleach lectured on audibility of phase distortion and correct time alignment of drivers in two-way horn systems. 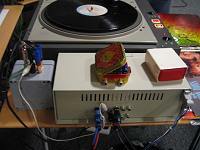 Finally Manfred Huber, with an amp suitable for the purpose, demonstrated how different means of biasing a triode amp affect the sound. There were twenty different approaches he covered. Huber's presentation came closest to one of the great traditions of ETF, namely a shootout. A shootout is an occasion in which the crowd votes on one of two contenders by booing and whistling, proceeding until a winner remains. 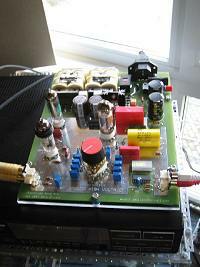 In 2002, the object was output transformers, in 2003 wide bandwidth drivers. I wasn't able to attend Hubert's demo but was told that while some biasing schemes clearly sounded better than others, it wasn't always easy to tell the difference. All the lectures were first-rate, clear and thought-provoking and absolutely worth taking a closer look a . I'm not going to do it here because I wouldn't be able to do them justice plus, everything's already on the Net. 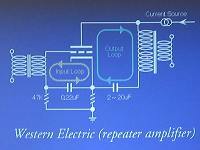 Lectures by Olson, Millet, Le Cleach and Hubert can be found at ETF's own website; a description of Steve Bench's RIAA amp resides here. Let me sum up instead what I thought was so great about these lectures. First, they were very entertaining and humorous in a no-nonsense way. Second, there was an equality of competence between the lecturers and the audience which contained experienced amp builders, transformer specialists and others who knew exactly what they were saying. No guru got off the hook simply because he was a guru. Third, single-minded as these people might be in certain matters, there was a venerable tolerance towards new and different ideas. This is not so surprising. Bear in mind that such tolerance often springs from the insight that understanding is not easy, and that if one bothers to go deeply enough into anything, most if not all of the dearly upheld principles and convictions are fit for the trash bin. This always questing tolerance was evident not only in presentations but in many private talks as well. Fourth, without indulging in nostalgia, there seemed to be a genuine respect for past audio engineering achievements and a willingness to learn from them. Again, this is no big thing. In audio perhaps more so than many any endeavours, development only very selectively turns into true progress. Finally and most importantly, what really made the lectures so wonderful was their spirit of collective resonance. My guess is that all participants were already well familiar with the sound of even versus odd-order harmonic distortion. Did that make Peter Millet's demo one inch less interesting? No. Not only was it very informative (there was no unambiguously best distribution of harmonic distortion components), what really made it and all the other demos so relevant was this group of knowledgeable people who jointly listened to what was presented and shared in the experience together. This social side is easy to dismiss as the hobby itself is by nature a fairly lonely business. But at the end of the day, it's all about having something in common. A brilliant manifestation of this aspect -- of being and doing together -- was the talk provided by Jean Hiraga, long-time chief editor of La Revue Du Son without whom there would be no Joe Roberts, no Kurt, no Christian, no ETF. 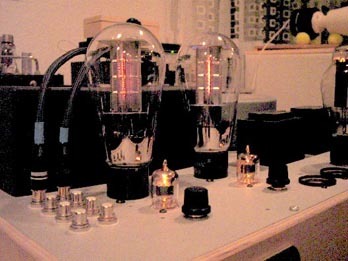 Hiraga first shared with us some interesting details of his personal HiFi history, how the whole triode fever started in Japan forty years ago and so on. He then briefly went through the history of stereophonic sound reproduction starting in 1881 when Frenchman Clement Ader used his sensitive microphones to transmit the sounds of the Paris Opera via underground lines to 50 listeners at the Exhibition Hall who could hear the opera using two receivers, one for each ear. Hiraga concluded his presentation by playing probably the very first stereo recording ever, a 1944 Brucker Symphony conducted by Karajan. As far as is known, it was recorded with three condenser microphones invented by Neumann just a year prior. The sound was almost beyond belief, the emotional impact colossal. Tears were close and applause fierce. It was grand, it was lofty, it was HiFi at its best. There were eight systems assembled in the most spacious rooms of the hotel -- eight systems, not 100 over three floors -- and three days to familiarize oneself with them. One of the great features of ETF is time. Time to sit down and relax, time to think and discuss, time to listen and digest, time to get deeply into it from early in the morning to late into the night, with a glass of wine or without one. To contemplate not only why something sounds as it does but what the sound is all about, how it serves different types of music. And so on. Another fine feature is the practice of circulating things -- a turntable, MC transformer, power tubes -- from one system to another to improve its sound. 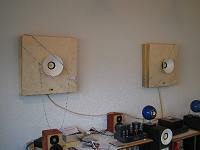 Among the eight systems, two relied on horn speakers. The big one in the main room consisted of huge four-way corner baffles with TAD 4001s behind TAD wooden horns, a Fostex super tweeter adding some HF energy for the two last octaves while two pairs of Altec 416s & 515s took care of the bass. 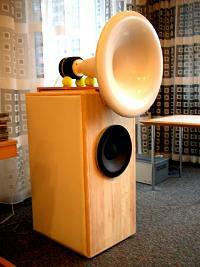 The speakers were driven by a heap of Thomas Mayer's amp arsenal. The French Team -- Jean Michel, Marc Henry and Dominique Mafrand -- brought a two-way horn system with TAD 2001s in a hypex horn on top of two 12" Cabasse units in a 150 litre isobaric bass cabinet, all drivers carefully crossed over and time-aligned. The signal from the CD player was fed digitally into a Behringer DCX2496 from where it went via a passive volume control to a 300B for the horn and AR mono blocks for the bass. 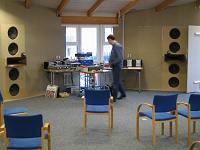 Other systems included Ralph Gibbemeyer's tall 96dB/W sensitive ribbon speakers with 18" JBL woofer driven by Ralph's own two-amps-in-one mono blocks (6W + 200W); Daniel Ciesinger's wall-hanging spiral horns with 6.5" Fostex FE108; Franz Gysi's back-loaded horns with 4" Fostex FE103; Johannes LeBong's resonant speakers (copies of Auditorium23 Rondos) with Seba green-cone units driven by a tiny 0.7-watt SET; and Michel Ulbrich's Axiom 80s in some kind of acoustic-resistance cabinet powered by Michel's own very special 300B stereo amp. Cantare presented interesting little dipole speakers and the Danes a two-way floor standing speaker with Thiel drive units. EMT, Garrard, Thorens vintage turntables are current attractions at ETF (one of the reasons why I so badly wanted to participate), as are Ortofon SPU/Denon DL103 type cartridges. More surprisingly perhaps, most CD players were fairly cheap and no less than five years old, the secret of course the modifications done to them. Some first- generation CD players with original DAC chips were very much in demand. ETF of course isn't about sound competitions. Every system had its strengths and weaknesses. Each system -- despite problems caused by less than ideal circumstances or some other reason more inherent to the system itself -- delivered sound as it was intended to do, at least in the sense that circumstances couldn't render the basic character of the sound unrecognizable. Each system also had a sound that in some ways went beyond or deviated from what's commercially available. It would be mediocre to dream of a sound that combined the best of all systems: the authority of the big baffles; the dynamics and accuracy of the French system; the sheer pleasantness of Daniel's system; the pure and simple joys of Johannes' combo et cetera. (With the little I managed to hear, Ralph's ribbons and Michel's Axioms sounded very good too.) Who would want that? Such perfection would kill the whole joy of the journey and inquiry. The people of ETF are the last ones to need encouragement to stick to two channels. 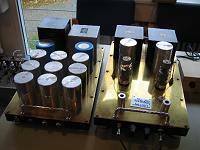 Yet there is an interesting connection between small triode amps and multi-channel, particularly 6 channels. The connection comes from the fact that digital crossovers are used with 2- and 3-way horn systems. There was one in the French system and a BSS FDS-366 Omnidrive in the big system at times. 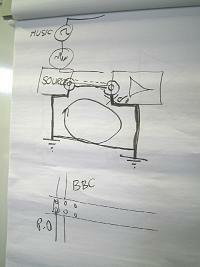 As to the latter, Christian had built a 6-channel preamp ("Betsy") that bypasses all the analogue circuits (with its cheap electrolytics and crappy ICs) of the BSS. 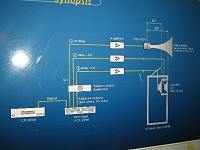 Instead, simple transformers fed the signal directly to the ADCs. 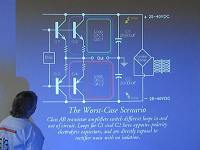 The signal was then picked up directly at the DACs and routed through a fully symmetrical 3rd-order low pass filter to the six tubed line stages (differential pairs of 12SX7s with constant current sources in the cathodes and line-out transformers). Christian was very happy with his preamp. The BSS sounds much better now. While ETF was of course all about tubes, there was one transistor-based presentation and what a beautiful presentation it was - by far most natural sounding one, too. It consisted of (1) a microphone, (2) a transistorized wooden piece with two antennas called a Theremin, connected to a mixing console and from there to the big system; (3) a red cloth with sensual German Dorit Chrysler inside; (4) candles, lots of them. 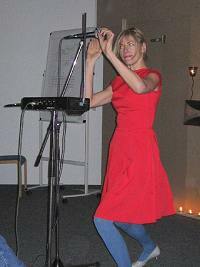 Dorit sang and moved her hands near the Theremin's two antennas without actually touching the instrument. That made her performance also visually rewarding.